Jeff Fenster, CEO of Everbowl, at the company’s Scripps Ranch store. Fenster says he sells more than 55,000 bowls a month at his locations. San Diego  For Everbowl founder, Jeff Fenster, who started the company in 2016 and now has 10 locations in San Diego and Riverside counties, using the word “superfoods” isn’t to get consumers to believe superfoods are new to the market nor that they can cure or keep a person immune from diseases. Left to right: Jennifer Borano and Amanda Melanese complete customer orders at the Scripps Ranch Everbowl outlet. 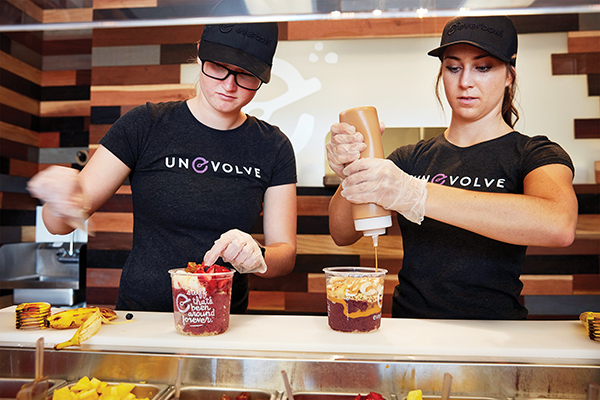 Company description: A San Diego-based chain that offers sugar-free, and organic superfoods bowls. The company’s marketing tag line is “made from stuff that’s been around forever,” and Fenster says it is using the phrase to encourage patrons to make better food choices and provide them with healthful food options in hopes they will adopt balanced diets lifestyles. Fenster says he sells more than 55,000 bowls of superfoods like acai and pitaya a month and that the company, which added a kefir water product dubbed K2O in January, is projected to make between $7 million and $9 million in revenue by the end of this year. He recently opened a store in Menifee in Riverside County and has more locations opening this summer, including stores at San Diego State University and in Mission Valley. His hope is to have 20 more signed leases by the end of the year, and eventually go nationwide. Unlike standards for other recently popularized food labels like non-GMO, gluten free and organic, the U.S. Food and Drug Administration does not require brands to follow certain criteria to use the term “superfoods.” In fact, while it has become a regularly-used buzzword in the last ten years as a descriptor of foods that are packed with high levels of nutrients like antioxidants, vitamins, and minerals, health experts say the word was created for marketing purposes and later adopted by publicists to increase consumer demand, adding that the classification has no standard definition or any true scientific basis.